Helen Clarkson was the birth name of "Helen McCloy," an American mystery writer, who served as president of the Mystery Writers of America and they awarded her with an Edgar statuette, in 1953, for her literary criticism, but, more importantly, McCloy is remembered for her body of work – consisting of roughly thirty novels and a dusting of short stories. 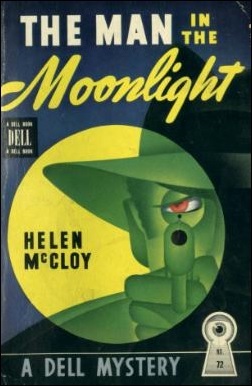 McCloy distinguished herself as a mystery novelist by incorporating elements of morbid psychology and (domestic) suspense into her otherwise traditional detective plots. And the result is usually outstanding! I've only read a handful of her detective novels, but all but one were good to excellent reads with the late-period Mr. Splitfoot (1968) being the standout title of the lot. Regardless of McCloy's successful track record, I read her only very sporadically (only two since the inception of this blog) and decided to finally pick up her much lauded Dr. Basil Willing series again this year. My perusing eye fell upon one of her earlier titles, which is a period in her career that I have criminally overlooked. 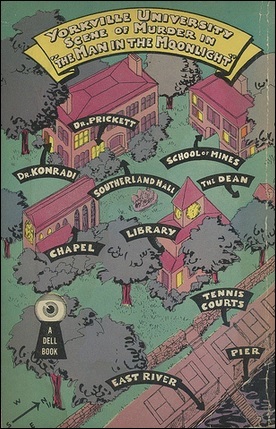 The Man in the Moonlight (1940) is not a typical American college mystery, like Clifford Orr's The Dartmouth Murders (1929), Timothy Fuller's Harvard Has a Homicide (1936) and Patrick Quentin's Death and the Maiden (1939), because the plot is driven by the war that was brewing on the European continent at the time – which I say on the assumption that the book was written during the last days of peace. However, the book already deals with refugees from Austria and Germany who fled when the Nazis took over. And one of these refugees brought a deadly problem to a small, unassuming American college. Assistant Chief Inspector Patrick Foyle is sitting in a park outside Yorkville University, where he plans to send his own boy to, pouring over college bulletins when he notices a piece of paper. A stray bit of paper that looked out of place in the clean, tidy park. Out of curiosity, Foyle picks up the piece of paper and astonishing reads the following, "I take pleasure in informing you that you have been chosen as murderer for Group No. 1" and to "please follow these instructions with as great exactness as possible." An astonishing note for a policeman to find, but the surprises don't end there as he's addressed by Professor Franz Konradi, a research bio-chemist, who escaped from Austria. Konradi happened to be missing paperwork and assumed Foyle had found one sheet of it. They discuss the murderous message of the note, but their conversation ends with Konradi telling Foyle that "no matter what happens" he shall "not commit suicide." An unsettling end of a conversation. Particularly, when "the academic peace was shattered by a pistol shot" emanating from Southerland Hall. Raymond Prickett, Professor of Experimental Psychology, was conducting an experiment by firing blank pistol shots above his infant son and meticulously writing down the reactions – not believing in the "vulgar superstition" of the Freudian mythology that his experiments will saddle his son with complexes when he gets older. So not exactly father of the year material, but the stage was now properly set and Professor Konradi dies that same evening inside his laboratory at Southerland Hall. Apparently, he actually did take his own life. Or so the evidence suggests. According to the evidence, Konradi placed the muzzle of a revolver between his teeth, in contact with the roof of his mouth, and simply pulled the trigger and blew out the top of his head. There were no marks of violence on the body. The lips and teeth were uninjured, which is considered clear proof of suicide, because a murderer could not make such a clean shot with an unwilling victim. An assumption strengthened by the fact that there was no smell of chloroform or tell-tale symptoms of a narcotic drug, but Foyle had not forgotten about Konradi's assurance that would never commit suicide and decided to call in the help of an old friend, Dr. Basil Willing. A psychologist who acts as a medical assistant to the District Attorney and is often consulted whenever a case needed a psychologist. However, a seemingly perfect murder is not the only problem the detective-psychologist has to contend with. At the time of the murder, Southerland Hall was used by Prickett to stage "a shame crime" as part of psychological test and he wanted to put everyone involved (willing or unwilling) through a lie-detector test, but now that Konradi has died nobody who was present wanted to be subjected to a lie-detector test – including Prickett! But that's not the only problem muddying the waters. There's the titular man in the moonlight who was seen that night and three different witnesses gave three different descriptions of this elusive person. A policeman who was task with guarding the crime-scene swore he heard a typing machine rattling inside the empty building that was followed by an inhuman scream, which "sounded like a lost soul cursing' the devil" and "callin' on God to let him out of hell." There are two additional murders and (of course) the potential presence of Nazi spies. Even the identity of Konradi is put into question, because he only used his elaborate equipment for simple, routine experiments. Plot-wise, I think the best part of The Man in the Moonlight is Willing separating the red herrings from the clues as he tries to figure out what happened that night and why everyone refused the lie-detector test. This part of the plot is also peppered with the kind of arcane medical, psychological and historical facts that John Norris touched upon in his review of the book, which make for interesting reading if you love these obscure tidbits of history. I never knew the preferred method of suicide for Austrians, at the time, was a bullet through the roof of the mouth or how a certain medical condition can influence the results of a word-association test. Only downside is that, by the end of this, there's one (somewhat obvious) suspect left standing and this person is brought to heel by a psychological analyses of the various lies this person told throughout the story. I think Willing's analyses could have used a physical clue, or two, to backup his psychological analyses, but, on a whole, the plot fitted nicely together and the motive for these murders was an original one – which affected the decisions of several characters. So, when you take a step back to look at the overall story, you can see how this book could very well have been titled A Web of Lies and Willing cutting through those lies is the real attraction of The Man in the Moonlight. It's a clever, well-written detective novel with a pleasantly entangled plot. All in all, I really enjoyed my time with The Man in the Moonlight, even if my reading of the book was plagued by interruptions, but it convinced me to return to McCloy's work more often. She genuinely was an American Crime Queen! I have already set my sights on such titles as Dance of Death (1938), Cue for Murder (1942) and The Further Side of Fear (1967), but I'll get to at least one or two of them later this year. So... that brings this review to an end. The first blog-post since my inaugural review of Pat McGerr's Pick Your Victim (1946), back in 2011, which does not use one of those confusing post-titles and vaguely related opening quotes. Admittedly, I cranked out this review a lot quicker now those first hurdles of finding a quote and coming up with a post-title have been removed! One thing I have noticed about the early Dell McCloys is that they are often savagely (and I mean savagely) abridged. I don't know if this was done with the author's consent. She is one of the best American authors of her period and you don't want to miss any details. I had to go back out and get the original hardcovers as a result. As I recall, the Dell edition of The Man in the Moonlight was one of those abridged editions and I had to replace it with the hardcover. Fortunately, I read the 2014 reissue from The Murder Room, which is, as far as I can tell, entirely unabridged. I only picked the Dell cover and mapback because they looked better than the dull, uniform covers of The Murder Room. Sounds quite the unusual book. Only read one book by McCloy. Been meaning to try her again and at least I now have one of her books in my TBR pile. I've no idea which one you read, or are planning to read, but you'll probably like Through a Glass, Darkly. And if you haven't read it already, I can also highly recommend Mr. Splitfoot. The coolly intelligent McCloy may well be my favorite American detective writer after Carr and Christie. She writes beautifully, understands people, and is interested in IDEAS. Have you read "The Slayer and the Slain"? I've not read or know much about The Slayer and the Slain, but I do recall that the book was mentioned, on one of these blog, not so long ago and not positively. Do you think it's any good or better than any of the titles I plan on reading this year (Dance of Death, Cue for Murder and The Further Side of Fear)? I'm always open to suggestions. I now have read six McCloy's in total: The Man in the Moonlight, The Goblin Market, Through a Glass, Darkly, Alias Basil Willing (the sole dud), Two-Thirds of a Ghost and Mr. Splitfoot (my personal favorite). A real pity about Alias Basil Willing, because McCloy had dedicated the book to Carr and it should have been as good as Darkly or Splitfoot. By the way, Christie was an American? Did I miss something? Half-American, at least - and her US publishers presented her as an American living in the UK. We pull ever so gently the leg. "Slayer" is excellent. Curt Evans and Xavier Lechard both admire it, a lot. It's a non-series novel, set at a college. And I won't say anything more. She Walks Alone, set on a snake-infested ship in the Caribbean, is also very clever. Dance of Death is fun, lots of good psychological clues. I think I liked The Deadly Truth and Who's Calling? more, though. Gollancz published all three of them in an omnibus, The Early McCloy. And, like you, I was underwhelmed by Alias Basil Willing! Thanks for the recommendations, Nick. The Slayer and the Slain and She Walks Alone have been added to my wish list. Through a Glass, Darkly is a good suspense novel, but suffers from an over inflated reputation. Particularly among impossible crime fans. So the book has a hard time getting judged on its own merits, because people pick up the book with certain expectations. Mr. Splitfoot is the McCloy title that deserves the reputation of Through a Glass, Darkly.